Once again, it's time for a smorgasbord of solutions to what ails us globally. Three of these come from friends! Let's start with my online friend, Sanford Hinden. I've never known anyone to try so hard to hit the right chord! This idea (or rather, amalgamation of ideas), I think, is resonating for people this time. It's the Commonwealth for Earth & Humanity. 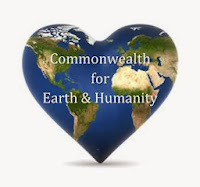 The Commonwealth for Earth and Humanity (CEH) Fund will invest in Earth, humanity and community. 1. See the vision of humanity as a whole. 2. Honor the Earth as sacred. 3. Remember the vastness of the universe and the preciousness of life. 4. Acknowledge that Earth as a planet with water and a climate that supports life is very special and rare in the universe. 5. Be devoted to creating sustainable families, sustainable communities and a sustainable planet. 6. Seek to promote new business models that honor the Earth and humanity. 7. Be patient, persistent, perseverant, co-empowering, collaborative and co-creative in creating the CEH. If you would like to participate, people of all ages, from any nation, are welcome to contact Sandy (sanfordhindenATverizon.net). 2. ASAP ISLAND: "CO-CREATE, FLOAT, SHARE"
Here's an interesting adaptive measure for floods and sea level rise. Now, I can't vouch for the seriousness of this venture (much of the publicity surrounding it seems to be a tad tongue-in-cheek), but they're raising funds on Indiegogo. And I figure anything that brings awareness to the climate change emergency is a good thing. I actually had to laugh at myself reading about this project. Depending on your age, this description either will make sense or just won't make any! Asap ["as soon as possible"] island is the vision of an autarkic [fancy word for self-sufficient] sustainable floating island, made out of recycled and renewable materials. It is low-tech, low-budget and open source, to help the people in flood-affected areas worldwide to raise their climate change resilience. It also serves as a global floating makerspace for open maritime innovations and eventually a realworld multiplayer game. Got it? A little open island for a better world. 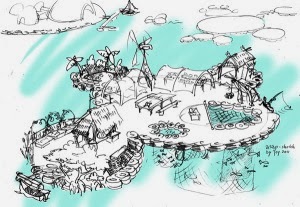 Asap-island will be low-tech, low-budget and open source, to empower the people in flooded and endangered areas to fight the results of climate change on their own. Started by the German street artist Joy Lohmann in the year 2000, the vision has meanwhile developed into a global community of makers, an artventurous concept and a feasible plan for how to realize it A.S.A.P. THE GOOD NEWS: the construction of the "as-soon-as-possible island" is to be started in early 2014 within a 6-week workcamp in Goa/India. The location and riverside is set from our Indian team, 4 workshops will be held by experts from 3 continents and I bet, the glocal participants will deeply enjoy to get it done. Check out their website (in German) and their blog (in English). They seem to be holding workshops all over the world. I think I'm going to splurge and go for co-ownership of one of these little floating arks. p.s. They're currently seeking mermaids. Our real-life friend Glenn MacIntosh in Toronto is still fighting the good fight. Through ecosanity.org, he puts out the most thorough compilations — probably in the world — on the global (lack of) response to the climate change emergency. Once you've spent some time going through an ecoS alert, you will understand the issue. Glenn's latest compilation, on the "betrayal of life" that was COP 19 in Warsaw, can be found here. Another wonderful real-life friend, Cory Morningstar, is an investigative writer who is helping us see the unending strings attached between the neo-liberal corporate world and what is passed off as grassroots green organizing. Isn't it amazing how poetry can cut right to the point? I hear you cry "Save the Amazon!!!" Yet every summer you replace your Home Depot (teak?) patio set. Yet if I suggest a transition to a plant-based diet, anger fills the air. Yet if I tell you that the cause is capitalism, you smirk and walk away. Yet you acquiesce to the voice of the colonizer while you dismiss the Indigenous voice with an unspoken superiority. Yet, you accept that the words and thoughts of Indigenous Peoples must be conveyed by way of white mouths. Yet I witness your acceptance of blatant, highly financed, white paternalism. And I know you are a liar.